In the village of Wreay in Cumbria, five miles from the city of Carlisle, stands the curious and beautiful St. Mary's Church, which since its construction in the mid-19th century has aroused much commentary and a good deal of wonderment. The pre-Raphaelite poet Dante Gabriel Rossetti called it "a church in the Byzantine style, full of beauty and imaginative detail, though extremely severe and simple" and by any measure "much more original than the things done by the young architects now." But he could not find words to describe the church well and wished for others to see this "most beautiful thing." A century later the great architectural historian Nikolaus Pevsner had his own descriptive struggles: he dubbed the building's style "Byzantino-Naturalistic," and said it was "a crazy building without any doubt." Yet when Pevsner put the question "What is best in church architecture during the years of Queen Victoria?" he insisted that "the first building to call out" had to be the church at Wreay. Similarly, Simon Jenkins, in his lovely book England's Thousand Best Churches, calls St. Mary's "one of the most eccentric small churches in England" but thinks it a masterpiece with no clear antecedents, no pattern from which it derives. Its architect was "a single original mind, … an individual genius." That genius was not a professional architect—indeed, lacked any formal architectural training—and was merely the chief landowner in the vicinity of Wreay. 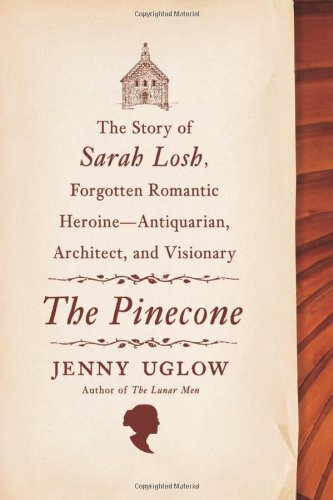 Her name was Sarah Losh, and in The Pinecone Jenny Uglow tells her story. The story, obviously, takes the form of a puzzle: Where did the idea for such a building come from? How could Sarah Losh have come up with it? Perhaps even more inexplicable is the question of how she, and the people she hired to build it, pulled off the design so successfully. Few writers could be better suited to pursue these questions than Uglow, who in her previous books—especially her finest, The Lunar Men: The Friends Who Made the Future, 1730-1810 (2002)—has demonstrated a great interest in how networks of like-minded people have the power to generate rich ideas and powerful inventions. The Lunar Men reveals how ambitious thinkers like the inventor James Watt, the physician and naturalist Erasmus Darwin, the manufacturer Matthew Boulton, the potter Josiah Wedgewood, and the scientist, theologian, and radical politician Joseph Priestley fed one another's minds in the years that they all lived in or around the city of Birmingham. In that account the lines of influence and mutual encouragement are clear—but how to account for Sarah Losh's solitary masterwork? That seems a far greater puzzle. And indeed, Uglow does not manage to solve it. There is just not enough information to go on. Uglow surrounds the core story of the building of St. Mary's Church with dozens of digressive mini-essays about—well, about almost everything pertaining to the place and time: the geology of Cumbria as it was discovered and explored in the Romantic era, the history of its churches and religious monuments, the rise and development of the city of Carlisle, the financial connections of the Losh family with the industrial city of Newcastle, Sarah Losh's father's friendship with William Wordsworth, the rise of Anglo-Catholicism and its influence on ecclesiastical architecture, the history of the village of Wreay after Sarah Losh's death. All of these excurses are interesting and well-written, but as I read The Pinecone I struggled to discern clear patterns. Uglow's description of the building of the church commences about two-thirds of the way into the book, and the reader who started with Chapter 15 would be about as well-equipped to understand Sarah Losh's achievement as the reader who had read every previous page with care. Stripped of Uglow's ample and learned contextualizing, the story goes like this. Sarah—as Uglow calls her throughout; I will follow that lead—was born into a Cumbrian landowning family near the beginning of 1786. She and her sister Katharine were given the sporadic and piecemeal education that was about the best that girls of their time could hope for, though Sarah's evident brilliance led to her pursuing ancient languages further than would have been common at the time. The sisters were by all accounts quite attractive, but neither ever showed any inclination to marry, and after the early deaths of their parents they became the socially and economically leading figures in their small world. They were both especially beloved as benefactors of the poor, but few elements of their local life escaped their attention and care. Katharine was the more outgoing, Sarah the more introspective and intellectual, but both were deemed charming. Above all they were inseparable companions, both at home and on their occasional travels to the Continent.